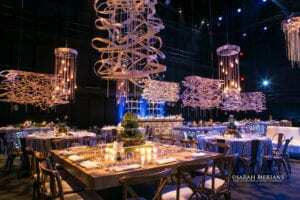 Carolyn Dempsey Design is an internationally recognized, premier event planning and production company that creates consummate event experiences, practicing the high-art of celebrating important people and connections. 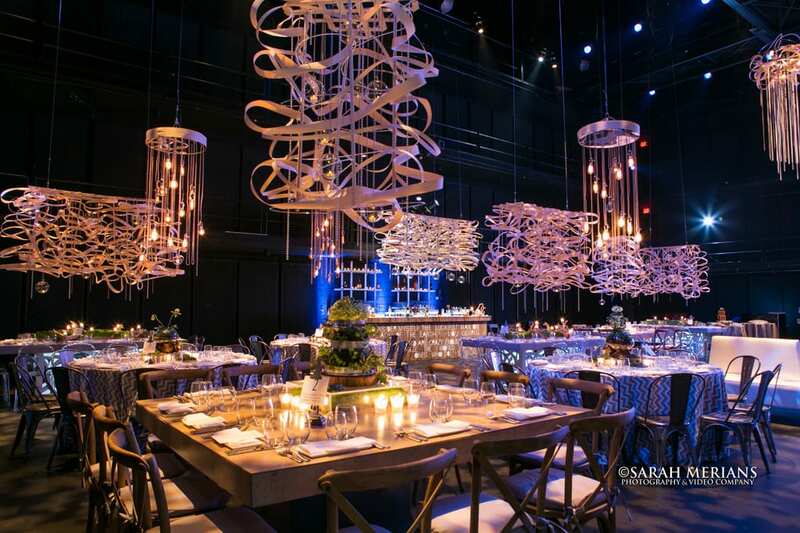 From intimate parties to elegant galas for private, corporate, and nonprofit, Carolyn Dempsey Design transforms space into spectacle, creating compelling and magical experiences. Conveniently serving clients across the tri-state area, nationally, and beyond since 2000. Carolyn Dempsey Design has offices, show rooms, and production facilities in Port Chester, New York. Congrats to Becca and Matt! The happy couple tied the knot in a beautiful outdoor ceremony at Rockrimmon Country Club in Stamford, CT. You could see the love in groom Matthew’s eyes when he saw his beautiful bride for the first time before they walked down the aisle to become husband and wife. The elegant purple bridesmaid dresses coordinated well with the blue pool in the background of our photographers’ portrait session. Purple was also brought in to the décor, conceptualized and executed from start to finish by creative event planner Monique Banks from Party! by Monique with florals by Carolyn Dempsey of Carolyn Dempsey Design. All of Becca and Matt’s friends had a blast moving and shaking on the dance floor. It was such a pleasure being a part of this milestone event with both of these wonderful families. The perfect fall day set the stage for Stacey and Dan’s wedding. Dan was all smiles awaiting his first look of the bride-to-be in her beautiful strapless and tulle wedding gown. The couple posed for our photographer, John’s, camera before heading down the aisle to become husband and wife. 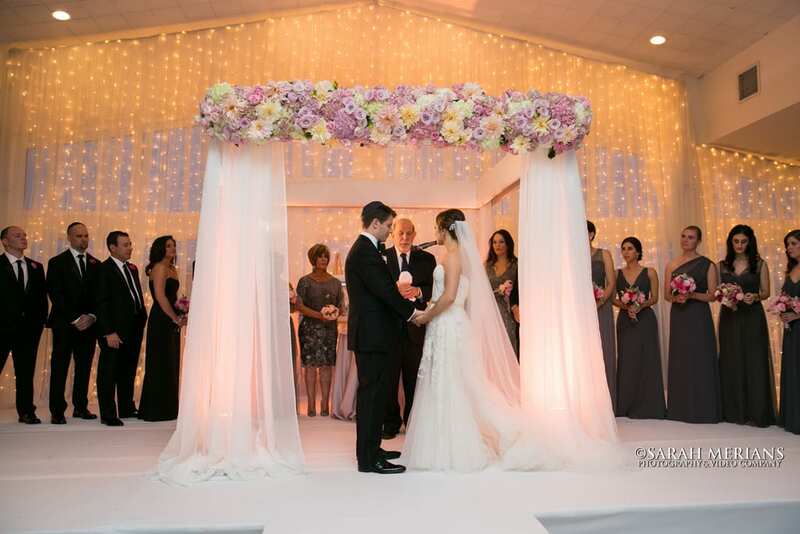 As they stood under the gorgeous purple and white chuppah designed by florist Carolyn Dempsey of Carolyn Dempsey Design, Stacey and Dan thought about the years to come. Rockrimmon Country Club was transformed with centerpieces by Carolyn Dempsey. The band, Washington Talent, came all the way from DC for Stacey and Dan’s magical wedding day. And so did the pizza delivery man! Guests got to chow down on pizza at the end of the night, courtesy of the bride and groom. 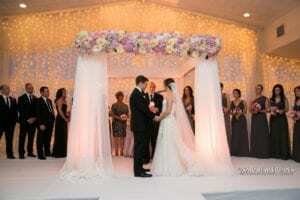 Congratulations, Stacey and Dan and Mazel Tov to your families!